After releasing well-sold Nexus 7 in seven-inch tablet market in a few months, Google now announced 10-inch tablet: Nexus 10, powerful rival to iPad 4, Kindle Fire HD 8.9 and Samsung Note 10.1. Various options are provided in tablet market with different configuration, screen size and material, etc, different brands, which brand you would choose? Below is key features comparison beween current most popular 10-inch tablets: Goole Nexus 10, iPad 10, Kindle Fire HD 8.9 and Samsung Note 10.1. 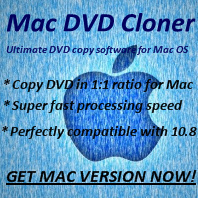 Read articles about ripping DVD to video for playback on iPad mini. 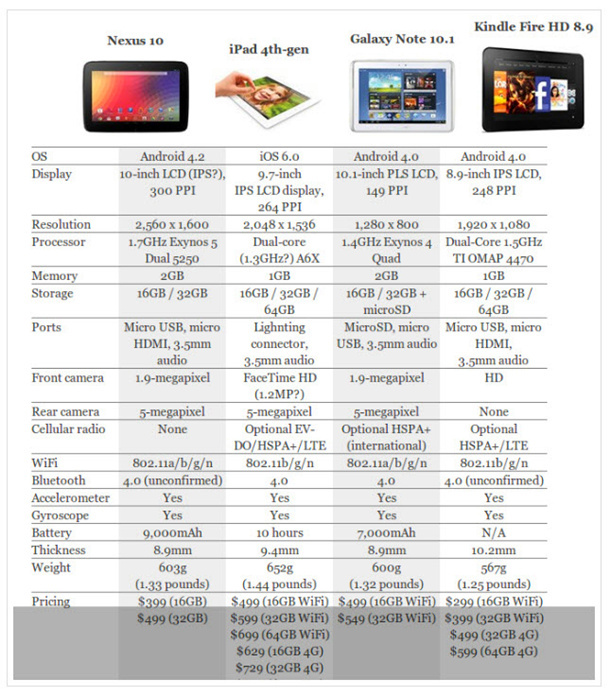 Comparison chart of iPad mini, Nexus 7, Kindle Fire HD 7. Compare the four hot ten-inch tablets in key features: Goole Nexus 10, iPad 4, Kindle Fire HD 8.9 and Samsung Note 10.1. Easy to find out Google Nexus 10 is with the highest resolution but a reasonable price, assume that Nexus 10 can be sold as well as Google Nexus 7. With such amazing screen, wanna watch your favorite DVD movies with Google Nexus 10? The most expensive one is Apple iPad 4 even it is not with the best resolution and it is heaviest amoung four. Howerver, A number of Apple fans or the ones who are used to use iOS devices would like to cost money on Apple idevies, no doubt that iPad 4 will still have a great sales record, how well need to be confirmed later when it is released on 2nd, November with iPad mini. iPad 4 also has the same price to the new iPad, no doubt that customers would like to choose iPad 4 for better core and faster speed. Samsung Note 10.1-inch tablet features with its amazing sensitive and convenient S-pen. In many ways the Galaxy Note 10.1 is similar to the 10.1" Galaxy Tab and Galaxy Tab 2 that came before it, but a few subtle modifications to the design and support for Samsung's S-Pen technology help set it apart. Unfortunately, some of the things that enhance the user experience with the Galaxy Note 10.1 have also forced design decisions that detract from the device. Amazon Kindle Fire HD 8.9 is not counted as a 10-inch tablet but we still like to add it in the comparison chart as it Kindle Fire HD is a real popular product released by Amazon. This item will be released on 20th, November. It has the same beveled backside, micro-HDMI, a micro-USB charging and data port, a 720p front-facing camera on the top of the bezel, and the same way-too-flush volume and power buttons on the right edge. The back still features a tabletwide black strip with speaker grilles at either end of it. The 8.9-inch model is thinner than the 7-inch one, sporting a 0.35-inch depth. It's only a hair thinner than the iPad (2012), and felt fairly light in my very brief time holding it. Higher resolution and more advanced core will be used for 8.9-inch, there are two key differences between 8.9-inch and 7-inch.